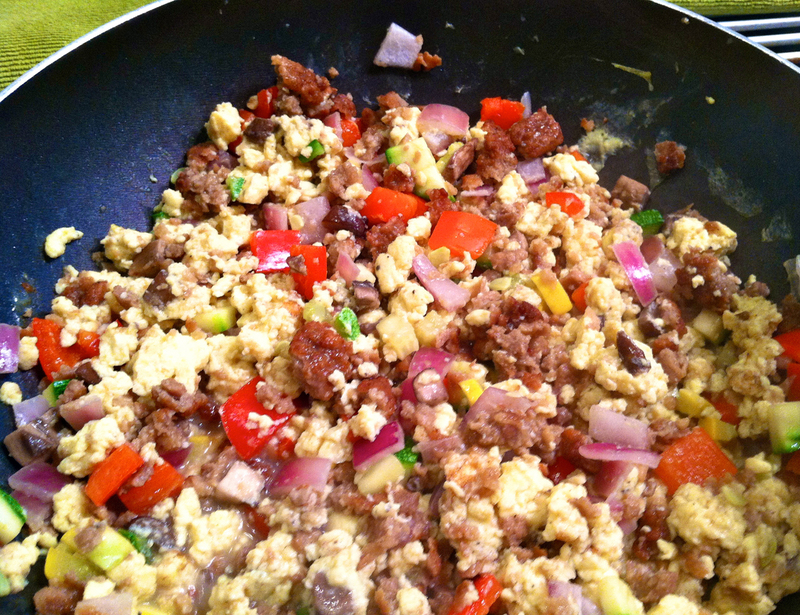 I’m not sure I ever posted about my usual breakfast that I make as often as I get the chance to for the past 3 years… I make scrambled eggs with veggie sausage. Well, I recently decided to change it up by adding veggies and although this is sooo not post-worthy, I decided to post about it anyway. I don’t make it the normal way, in fact, I don’t really like eggs unless I make them this way. I know you’re supposed to put like a tablespoon of milk into your eggs no matter how you end up cooking them, but I put in 2 oz of milk for EACH egg. I usually only eat 1 egg in the morning, and it fills me up and keeps me full for half the day, and I usually lose weight when I’m consistent with eating this… probably because it’s filling and I don’t need to snack the day away. Also, I have high cholesterol, so one egg with yolk provides me with a ton of nutrients but won’t up my cholesterol. Benefits def outweigh the risks when it comes to egg yolk. I don’t care much for egg yolk, but I eat it for the nutrients. Most people avoid it, and I haven’t figured out why. Maybe if you’re eating like 4 eggs, then yes, avoid most yolk, but keep one! It’s like a multivitamin! Anyway, I recently spiced up my fave morning dish with some fresh veggies, and it really upped the ante on my mornings. And it’s not hard, I do make extra for the following days though. For the sausage, I actually use veggie sausage patties, which I am in the process of trying to find a better option, because I’m not really into all the fake crap that goes into these things. I could go for real sausage on occasion, but not for daily intake. If you have suggestions, let me know. But I use one sausage patty for each egg as well, and i heat it and dice it and toss it in once eggs are almost cooked. The veggies I use are normal- green and yellow squash, mushrooms, onions, red peppers. Like I said, not post-worthy, but just a suggestion for a different way to cook eggs. And yes, keep the yolk!